Homemade is where my heart is. So after I finished the edge-of-lace hat from my last post, I worked up some mitts based on the cuff pattern associated with the hat. I did the cuff in the lace, then just continued on up and added a basic thumb. They were really pretty, and they used up the last of the purple yarn I used on the edges, and they didn’t fit. I have particularly small hands, and when I tried to wear them out they fell right off my hands. Sigh. But they look nice on my neighbor, and I like my neighbor. 🙂 So I made myself more mitts but didn’t try the edge of lace pattern again. I needed fewer stitches in mitts made from this thick, sturdy multi-colored yarn, so I just up one more (small!) pair in a very basic pattern that was easy to make smaller and added the cable pattern up the front for visual interest. The trim yarn doesn’t exactly match the hat, but it coordinates. 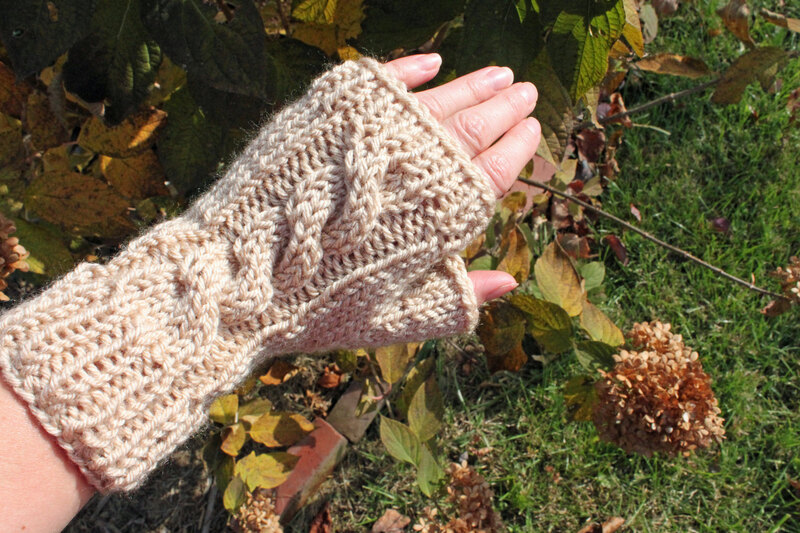 And they don’t fall off, which is really one of the most important features in mitts! Do you want to know how to feel like an idiot? Here’s one way. 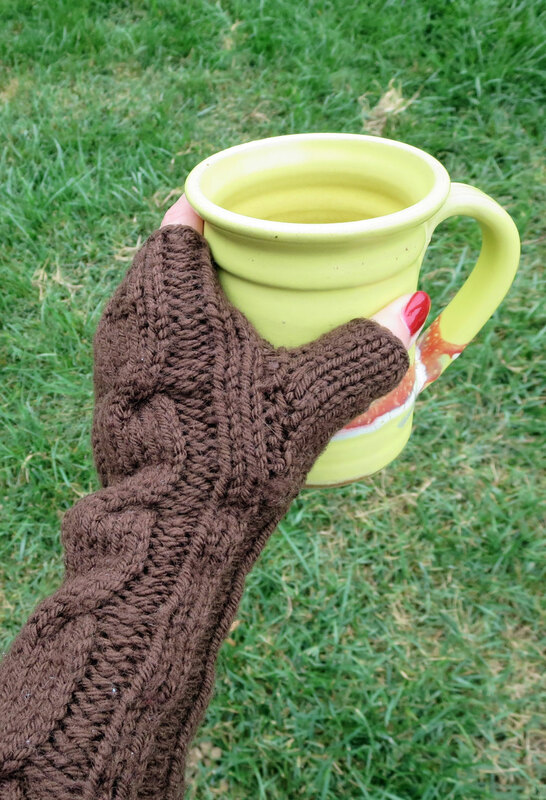 First, you make really pretty brown mitts for yourself and blog about them. Next, you lose the gloves the first time you actually wear them. 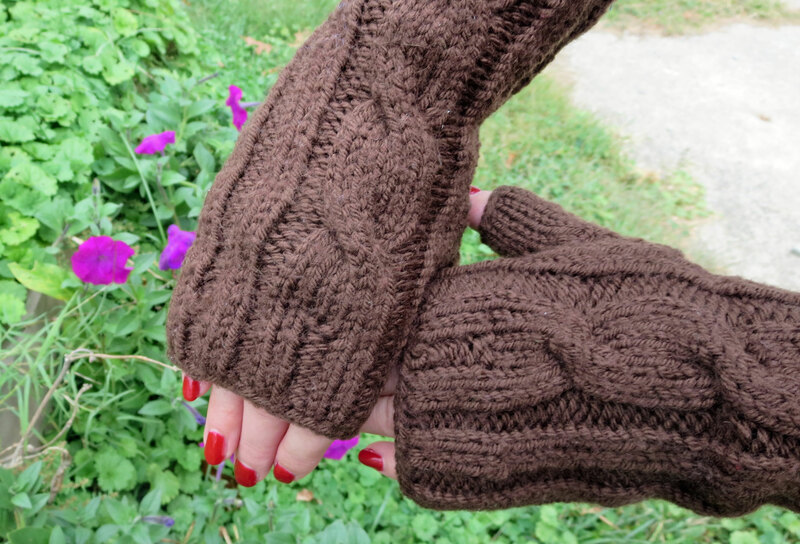 Finally, you keep asking people if they’ve seen your brown gloves, because you are missing a pair, and listen to them say, “you mean the ones from your blog?” Because I promise, then you will feel like an idiot. Yes, I made gloves. Yes, I blogged about them. Yes, I lost them. I am an idiot. 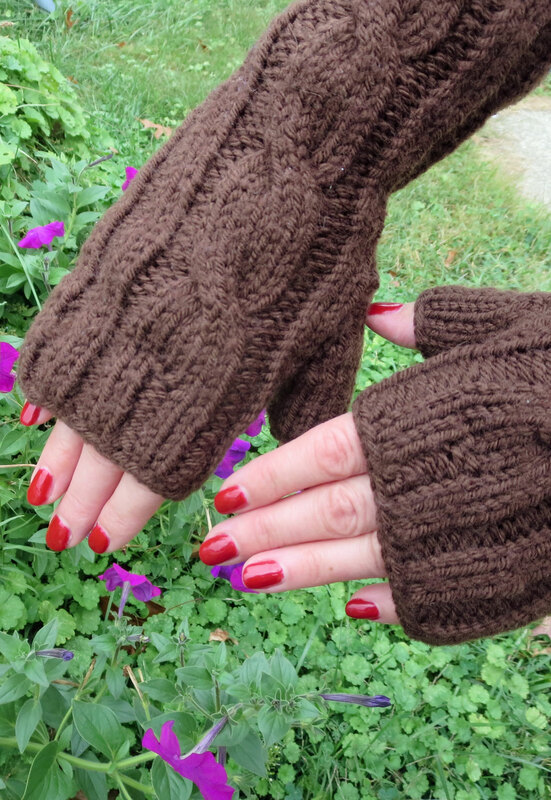 I’m still in hopes that the brown gloves will turn up eventually, but in the meantime the temperature is dropping and I really do want mitts to wear with my orange coat. I was out of the nice brown merino I made the first pair from, but a friend just sent a bag of hand-me-down yarn and there was some soft acrylic in a nice oatmeal color, so I found a simpler (quicker, larger gauge) pattern and made a new pair of mitts. I didn’t put long cuffs on these, and they only took a couple hours per glove. Now I feel slightly better in that I have gloves again, but still sort of mad in that I wasted four hours of my week re-making myself gloves when I’m actually supposed to be working on Christmas gifts. A warm idiot is better than a cold idiot, right? Oy! First, can I say that my nails are never this fabulous? I think it’s a little ironic that the one time in years I have ruby-red nails, I also happened to be including my hands in a photo for my blog. Maybe it was a decision made by my subconscious, as I saw the mitts nearing completion. My conscious self painted the nails to hide the superglue that is holding one of my nails to the bed after something horrible happened while I was changing someone’s sheets. So far the nail is actually hanging on there, so perhaps vanity (in the form of red fingernails) is actually a way to avoid pain just this once. Moving on to my cute fingerless gloves, which I hope will far outlast both my manicure and my injured nail. I bought two pairs of cheap fingerless gloves last year after I finally entered the smartphone part of the population several years after everyone else. I have to admit, I totally didn’t get the fingerless gloves fashion thing until I got the phone, and then the little lightbulb when off–oh! You can text with them, but they still keep your hands warm! Yeah! So one pair has the part that keeps your thumb warm, but the other pair, which is brown and actually goes with more of my outerwear, does not. I don’t know what kind of trick of thermodynamics causes fingerless gloves with the thumb part to be warm and toasty, while fingerless gloves without the thumb part do nothing to keep your hands warm and might as well by ice cubs laid directly on your hands, but it’s true. 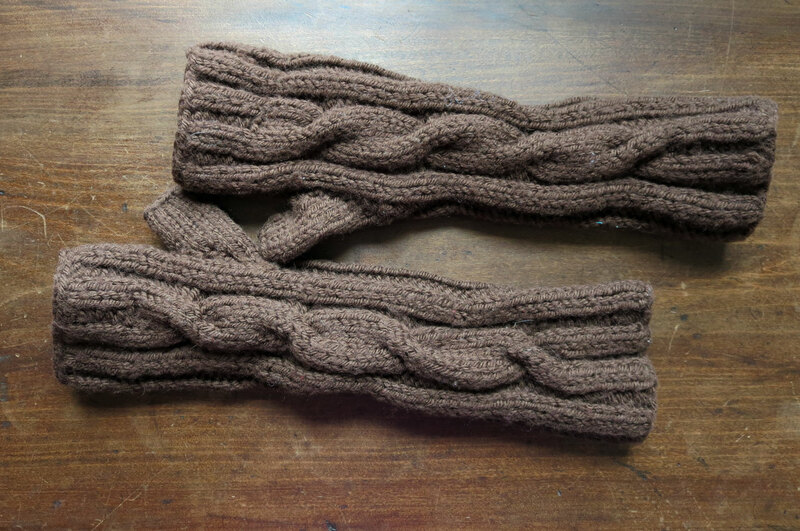 So I needed a brown pair with the thumbs, and since I don’t have a newborn tying up my knitting space this year I decided to make a pair for myself. 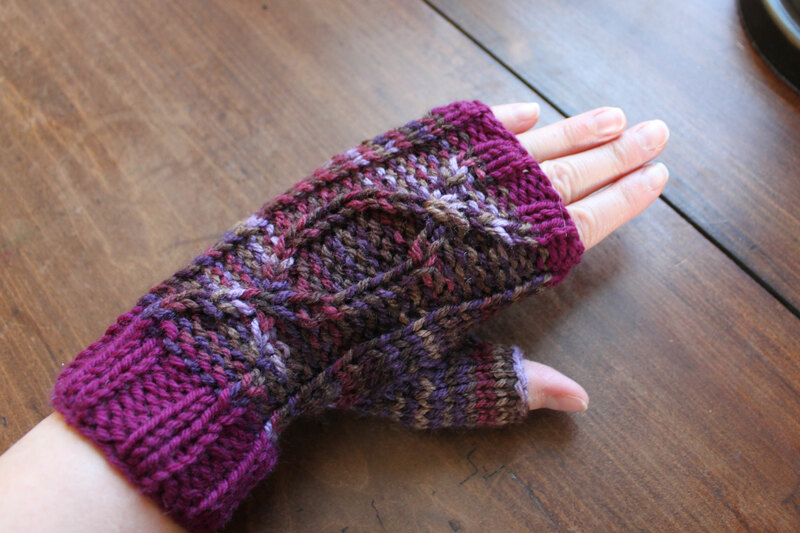 I used Knitpicks’ Swish worsted yarn (my go-to favorite) in Bark for this project, and Valerie Teppo’s One Cable Mitts pattern, as suggested by a friend. I decided to do an extra repeat of the cable pattern going up the arm to make them extra-long, so no cold could creep up my sleeves. I also made the hand part just a bit longer than the pattern calls for, again for added warmth. These have already been through the washer and dryer and are soft and cozy and just what I wanted. I’m excited to toss out the useless thumb-less pair I bought last year, and use touch-screen electronics fearlessly in the cold this winter! 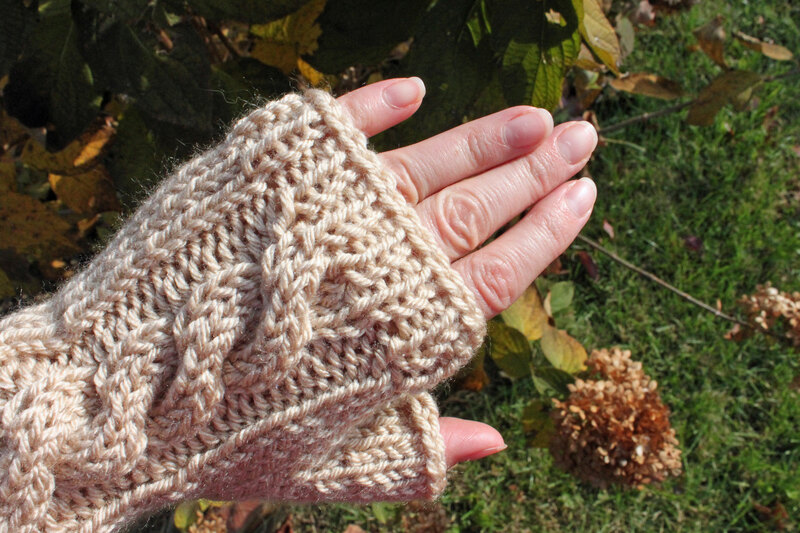 Aside note for knookers: As usual, I knitted these mitts on a knook instead of knitting needles. Cables are super-easy to knook, but something went a little wrong with the way the thumb attached to the main body of the mitts. I don’t know if it’s some quirky knooking problem, or if the problem was just the way I translated the pattern to knooking myself. Anyway, there were open spaces that needed to be seamed up at the end that shouldn’t have been there, but seaming them up solved the problem just fine. Want to buy travel trailer merchandise designed by me? Buy travel trailer t-shirts, mugs & gifts from my Cafe Press shop.